Did you know that according to a recent global perception survey, San Francisco is the seventh happiest city on the planet? 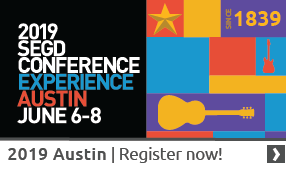 It’s not hard to imagine why, and its attractions and design zeitgeist are the primary reasons why we’ll be gathering there June 6-8 for the 2013 SEGD Conference! Join SEGD at a three-day design conference in San Francisco. Educate, Connect, and Inspire with the global, multidisciplinary community of professionals who plan, design, and build experiences that connect people to place. “Above the Fog” takes you to the next level of inspiration in business and community. (May 2, 2013) SAN FRANCISCO -- Pentagram partner Natasha Jen, whose graphic design work is noted for crossing the boundaries of media, discipline, and culture, will be a featured speaker at the 2013 SEGD Conference, Above the Fog, June 6-8 in San Francisco.